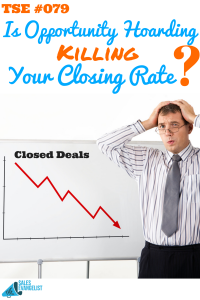 Home » TSE Podcast Post Page » TSE 079: Is Opportunity Hoarding Killing Your Closing Rate? So, several years ago my wife introduced me to a TV show on TLC (Opps, I said HGTV on the episode instead of TLC) called Hoarders. I am sure you have seen it or heard of it before. The people on the show all have mental or emotional challenges that prevent them from letting go of their belongings. Even things that don’t work or they don’t need. Sometimes the hoarding becomes so horrible that these individuals’ health and homes fall into jeopardy. But because of an emotional connection or fearing if they were to get rid of anything, they think they may need it in a future date. They still can’t let go of their useless belongings. On the show these people sometimes have a family member or friend who comes in and has an intervention with them to overcome this challenge. Well, the funny thing about this example is the fact that it applies to us as sales professionals. Think about it, we have all been there! We have a pipeline FULL of potential opportunities. People who at one point were interested in our products or services, but for some reason the deal has died and just like someone with hoarding tendencies, we are afraid of closing the opportunity out and focusing our energy on new qualified opportunities. We hold on it forever, hoping that they will come around and you will close this big deal. If you are doing this, news flash – you are an “Opportunity Hoarder”! However, don’t you fret. 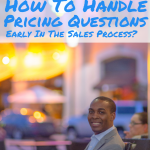 I am here to help you have our very own intervention that will let you get through this process and potentially increase your close rate on more meaningful deals. 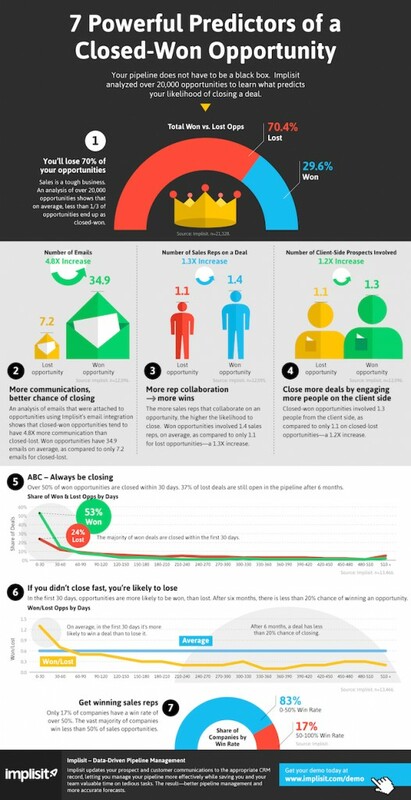 In a recent HubSopt article written by Emma Sinder, she discusses an Inforgraphic done by Implisit who studied 20,000 sales opportunities and discovered some key indicators that made a deal close more so than others. The study also shows that 70% of a company’s opportunities are lost, while the other 30% will turn into won deals. But for some reason the sales people are living in denial and don’t seem to want to let go of the 70% of lost deals and focus on getting others who fall into that 30% criteria. So, what are those key indicators or attributes of a deal that is worth pursuing vs one that is not? Let’s take a look below. Email Communication: Opportunities that fall into the “Won Range” had 4.8 times the amount of sent and received email communication between the reps and the champions. If they are not communicating with you, then this is the first indicator that this opportunity is not progressing well. More People Are Involved: Deals that are more likely to fall on the won side have more people involved both on the side of the seller and that of the prospect. Won opportunities have an average of 1.4 individuals working on them compared to 1.1 on lost opportunities. This may mean that you have a project manager, sales engineer etc. On the buyers end, the average opportunity that turns into a “WIN”, will have about 1.2 times more people on the prospect side as involved as well. This may be the decision maker, the champion, influencer or end users or their end. Things Progress Quickly: Deals that will turn into a win generally close quicker. The study show that more than half of all won opportunities closed within 6 months. After 6 months of sitting out there, there is a less than 20% chance that the opportunity will become a win. From examining this data, we have some great indicators that can help us know what to throw out and what we should hold onto. Now, obviously, some industries just have a longer buying cycle than others, but the principles are still the same. If your opportunities do not have communication, minimal people involvement from both sides of the opportunities or the deal has been sitting for over 6 months, it may be time to take it out of your pipeline and find new ones. It may be difficult at first as you start getting rid of stuff, but just like those with hoarding challenges and go through the de-cluttering process, you will be happier and your pipeline will be healthier in the long run. You will increase your close/win rate because you will focus on ideal opportunities and the commission will start rolling in. I promise you. If you have specific practices that you have employed to freshen up your pipeline let me know in the comments below. Or share it with the community at Facebook.com/TheSalesEvangelist.